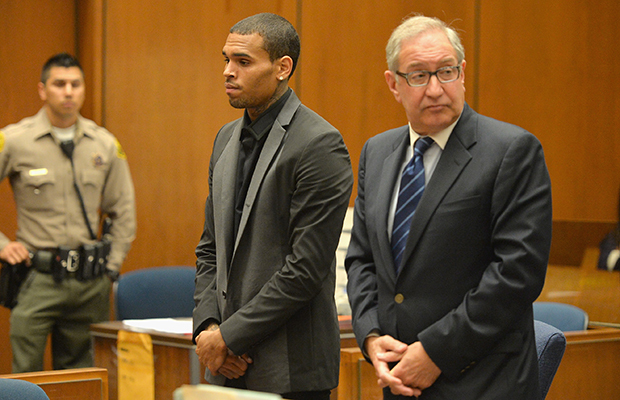 Update: Judge James Brandlin ruled to revoke Chris Brown's probation. A hearing has been set for August 18. Nothing in Chris Brown's life is ever drama free. In court documents obtained by omg!, the District Attorney of Los Angeles County is requesting to revoke Brown's probation stemming from his 2009 assault of Rihanna. The request is based on charges filed against the "Fine China" singer in connection with an alleged hit-and-run from May, for which he was also charged with driving without a valid license. Brown faces a maximum punishment of six months in jail and $1,000 fine for each offense. TMZ alleged that during the fender bender that occurred on May 21, Brown refused to give the driver his driver's license number and also gave incorrect insurance information. Brown has claimed from the beginning that he gave correct information. The 24-year-old is still maintaining his innocence, tweeting on Monday. What makes this case even more unusual is that the lawyer of Brown's hit-and-run victim is reportedly heading to court to defend the singer against the D.A. 's latest request to revoke probation. The D.A. is not asking that a warrant be issued for Brown's arrest, but rather that the court remands the defendant and schedules a hearing for further proceedings. If the judge finds Brown in violation of his probation he could face up to four years in prison. It's also not the first time the L.A. DA has gone hard after Brown. The DA filed the charges in the original hit-and-run case. Back in February, she also claimed that he failed to provide proper evidence that he completed his community service sentence following his 2009 assault of Rihanna.